PTC’s annual conference is the Pacific Rim’s premier telecommunications event. 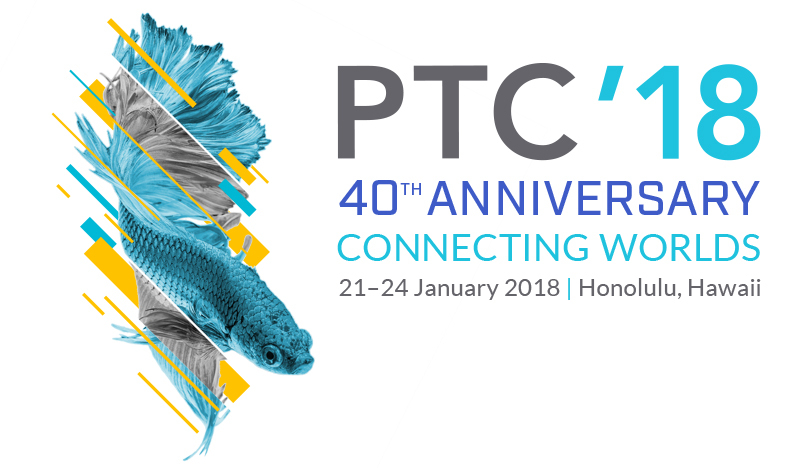 PTC’18 will be the 40th Anniversary celebration, opening a new decade of connections. The conference provides all attendees with a three-day platform to focus on planning, networking, and discovering what the new year will bring. PTC’18 brought together 7,000+ members and industry attendees in Honolulu, Hawaii from 21-24 January 2018 to share and explore the critical transformational shifts of the next four years, and the next forty years. Industry leaders take the stage and share their vision for how to drive and lead across Connected Worlds. View the Complete PTC’18 Program and join us as we celebrate the 40th Anniversary. With opportunities ranging from promotional branding to live events, PTC’18 sponsorships will strengthen your company’s profile, visibility, and positioning across the global telecommunications industry. The PTC Innovation Awards are designed to recognize the individuals and companies that have transformed and continue to transform our industry and the markets we serve. PTC welcomes Nicole Fuertes, as its marketing and communications director. She brings with her more than 15 years of public relations and marketing experience to the organization. The Pacific Telecommunications Council is recognized as the global non-profit membership organization promoting the advancement of information and communication technologies (ICT) in the Pacific Rim, the most dynamic geography of the world, spanning over 40 nations. PTC is at the nexus of two of the most important trends on the senior leadership agenda today: the rise of the networked digital society and the exponential economic growth in Asia and beyond. As a membership organization, we mobilize global leaders in telecommunications and information technology industries so they can drive the development and deployment of ICT across the Pacific region and beyond. As a non-profit, we are dedicated to educating professionals in and about the region. We spark, and guide, conversations and collaborations that set the stage for the deployment and growth of ICT throughout the region and beyond. As a global organization, we engage the broadest community of professionals, organizations, technologists, researchers, and influencers who together ensure progress in our industry while improving the quality of life in Pacific Rim communities. We help our Members innovate and build competitive advantage in the ICT industry. Our Members’ involvement helps nations develop infrastructure that changes lives. PTC’s reach expands far beyond its renowned annual global conference. PTC is a rich community, active every day of the year. Helping members innovate and grow advances in our industry. Helping nations develop infrastructure that changes lives. Fostering up-and-coming scholars in the ICT field by recognizing their research at the PTC Annual Conference. Delivering the data to seize micromarket opportunities and understand complex dynamics and resources access throughout the Asia-Pacific region. Providing management training to rising industry leaders. Designed to drive professional advancement seldom addressed by formal education or institutional training. Join PTC. PTC membership is the most powerful way to reach and connect with leading companies, executives, prospects, partners, and thought leaders in ICT.